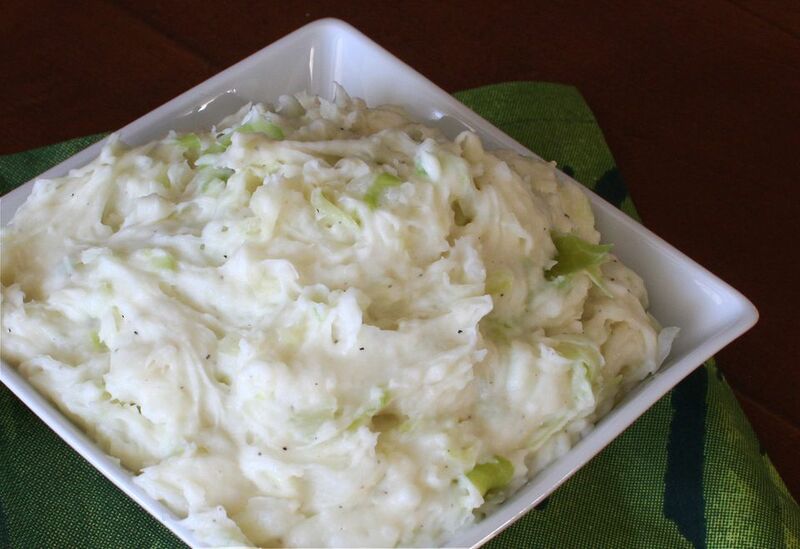 This delicious potato dish is a combination of mashed potatoes, cooked cabbage, and optional green onions. This is a great dish for St. Patrick's Day, or enjoy it as a side dish to ham, roast beef, corned beef, or sausages. It's easy to prepare and wonderful any time of the year. These potatoes can also be made with cooked kale, and they're also wonderful with sautéed leeks instead of the green onions. Put the potatoes in a large saucepan and cover with water; add 1 teaspoon salt. Bring to a boil, reduce heat to a simmer, cover, and cook until tender, about 15 to 20 minutes. Meanwhile, steam or boil the cabbage in lightly salted water until tender. Drain and set aside. Mash the potatoes with the butter and 3/4 cup of milk. Add more milk, as needed. Stir in the green onions, if using, and drained cabbage. Taste and add salt and pepper, to taste. These potatoes are wonderful with an Irish-themed meal. Serve them with corned beef or roasted lamb. For more green, use cooked kale in the mashed potatoes instead of cabbage and sauté some thinly sliced leeks to replace the green onions.